Amazon.com Price: $9.98 (as of 2019-04-22 02:59:32 GMT) Product prices and availability are accurate as of the date/time indicated and are subject to change. Any price and availability information displayed on Amazon.com at the time of purchase will apply to the purchase of this product. The award winning Elder Scrolls saga goes online. 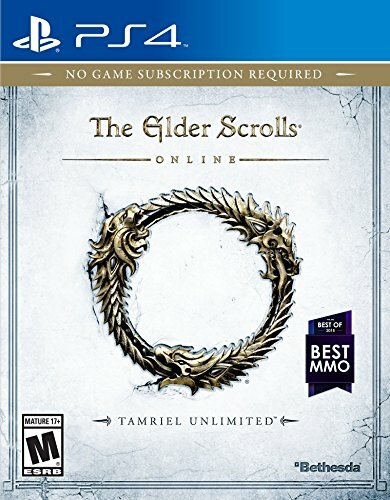 In The Elder Scrolls Online, experience one connected world and stay up to date with everything your friends are doing in one of the most socially enabled games ever. Whether you play alone or with your friends, the game’s innovative combat system allows you to focus on action and tactics, not the UI. Use any weapon at any time, no matter your class, and customize your abilities to play the way you want as you uncover the mysteries of Tamriel and seek heroic quests on your own terms. Explore the far reaches of Skyrim, the mysterious lands of Morrowind, the sprawling metropolis of Daggerfall and beyond. The choices you make, from the alliance you join to the battles you fight, will shape your destiny and the world of Tamriel. The Fight for Tamriel Begins: Three alliances vie for control of the Empire. As these powers battle for supremacy, darker forces move to destroy the world. Play the Way You Like: Battle, craft, fish, steal, siege, or explore. The choice is yours to make in a persistent Elder Scrolls world. A Multiplayer RPG: Adventure alone, quest with friends, or join an army of hundreds in epic PVP battles. Tell Your Own Story: Discover the secrets of Tamriel as you quest to regain your lost soul and save the world from Oblivion.